It is no secret that the Ethiopian Satellite Television, ESAT, has become the most popular television program in Ethiopia and around the world. Despite the continuous jamming of ESAT by the Ethiopian regime, ESAT has stolen the hearts of millions in such a short time. Tens of thousands have called ESAT television station when it went off the air twice. The emails and the numerous telephone calls ESAT's office recieved seem to indicate a solid moral backing for this free media. And ESAT is a must-have for our people in Ethioipa who at this time are denied access to free television and print media. That is why our people need ESAT more than anything else. They want to be informed and they like to know what is actually going on in their country. Knowledge is power. Informed people can and will change their circumstances. They will bring, on their own, the changes they seek. But we have to give them the chance to determine their destiny. ESAT is that chance. And it is the means to our people to establish peace, demorcacy, and freedom in Ethiopia. 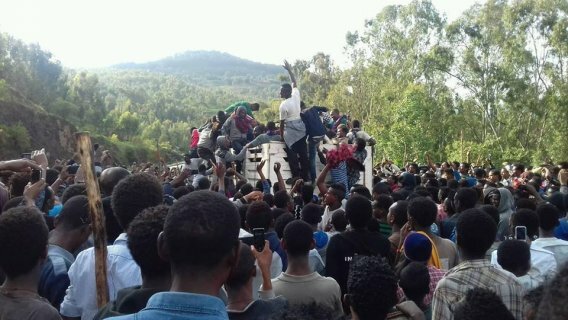 And the burden to provide this chance to our people lies totally on Diaspora Ethiopians. It is a historical duty and a patriotic obligation to support ESAT financially at this critical moment. If we say we love our country and if we mean what we say, then let us prove it. Let us keep ESAT on air for the sake of our people and Ethiopia. Our people are forced to live in total darkness. They have nowhere to go and nobody to ask. That is why they continously call ESAT to resume broadcasting. They tasted ESAT. And now they can't live without it. ESAT is the only hope our families and relatives rely on for reliable information. ESAT is their guiding light. ESAT is their torch to brighten the path showing their future. A bright and promising future. We have to be there for them if we say we love them. We need to subscirbe to ESAT and keep it on the air. It does not cost an arm and a leg to help ESAT. Nobody goes hungry or gets behind morgage payments by supporting ESAT. All it costs is 50 cents or a dollar a day. Is there any Ethiopian in the Diaspora who has any job that could not afford this much for the country or people he or she claims to love? If we love our people and our country, let us show it. Let us not say it. Forget the big speeches. And the empty promises. Just show it. Quietly and courageously. Bragging is enough. We have bragged for too long. Almost for twenty years now. Ethiopia and Ethiopians are bleeding. Bleeding to death. They are not looking for empty words. They want real help. Help they can touch and see. They want action from the Diaspora Ethiopians. There are thousands of us here in the Diaspora. The fate of our people is really in our hands. The power to save our country squarely lies on our shoulder. Where are we? What are we doing? Do we want to be free? Do we love to see our families and relatives to live in freedom like we do here in the Diaspora? If our answer is no, then you can kiss freedom for us and for our people goodbye. And we have chosen to live in shame and humiliation. If our answer is yes, then Ethiopia, Ethiopians, and ESAT need all of us. And we have chosen freedom, respect, and hope. For us and for our people. Don't make the enemies of free media happy. Don't help the enemies of freedom by not helping ESAT. Subscribe to ESAT now. You will be glad you did. It does not cost much. Not at all.